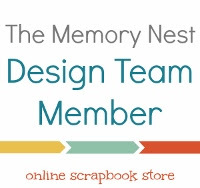 I super excited to announce that I'm a design team member for the Memory Nest for July and August! So keep your eye out for some cute layouts that are coming! Yay congrats! I'm excited to be joining, too!